In Korea, strawberry season is a thing. From December to June, there aren’t just strawberry lattes and strawberry cakes and strawberry bingsoos (that Korean shaved ice dessert with sweet toppings) in pretty much every coffee shop. 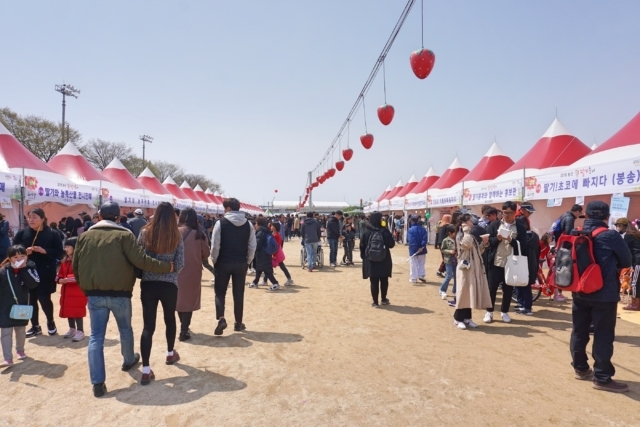 There’s a festival in April dedicated to the fruit as well. 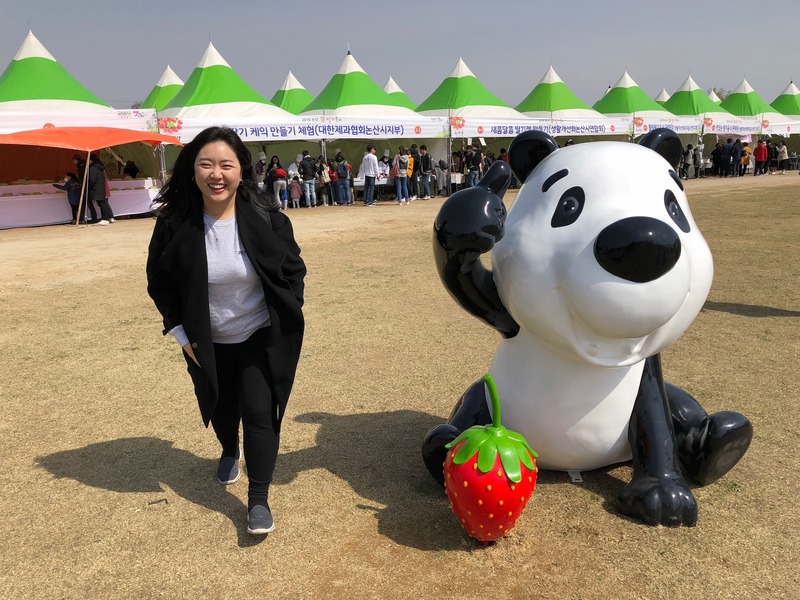 With my friend, we went on a little out-of-Seoul adventure, caught a KTX train, and made our way to Nonsan – a city in South Chungcheong Province, about 150km south of the capital, and home to a variety of strawberry farms. What we found there was a day of fun. And our timing for all the activities was spot on, so I definitely recommend going early. 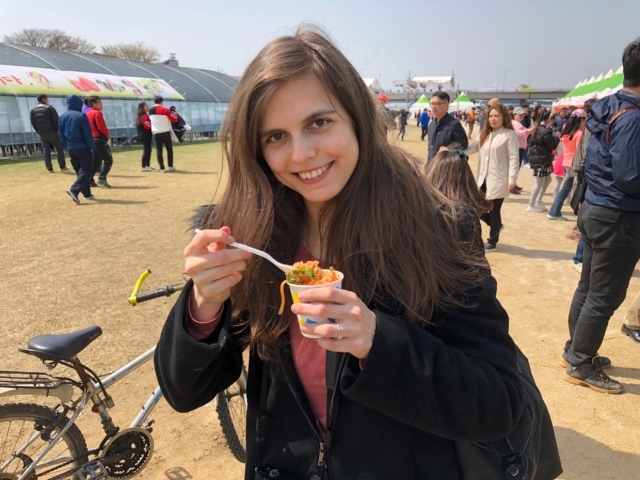 As we approached the festival site, in the middle of a large field a little while away from the more than 100-year old train station, my friend confessed to me it was her first time to go to a food festival like this in Korea. We were on a par with each other, both going into it with no expectations but with excitement – and plenty of it. Nonsan, when called by its other name Nolmoi, means dusk(y) or yellow mountain. The origin of this name is said to have come from the small garden “Nonmoi,” which rises in the middle of farming fields. It was this rural feel of the city, a breath of fresh air from the buzzing business of Seoul’s urban streets, that we let settle down upon us as we stepped off the train and into our little day trip adventure. Although the agricultural city, with rice being its most important crop, is known for growing strawberries, when you ask any Korean, especially Korean men, the first association that comes to mind is the ROK (Republic of Korea) Army training center. It is here, or one of several other training bases, that every Korean man will eventually need to spend several weeks at before being deployed to his designated unit. Korean men receive their basic training here or else face prison. For all its army history and associations, the city of Nonsan felt rather unimposing. We found it first filled with calmness and fields, on a late April morning, then with strawberries and more strawberries as we strolled past the festival stalls. The statues specked across the festival were random as could be, but provided excellent photo opportunities. Dinosaurs, panda bears, muscly golden men holding giant strawberries, they had it all, allowing the kids’ imagination to run free, and ours as well. We joined the line that had started forming for the tasting of strawberries. We were ushered on to try just one, but it was sweet and juicy and worth the short wait. Some other stalls offered tastings too, strawberries freshly picked from the farms, waiting to be sold. But we moved on past strawberry tea, past strawberry jam as it was being made, and on to strawberry cake. We were like kids in a candy shop, surrounded by the former and excited by the latter. For 30,000 won (~$27), we set out to assemble, decorate, and then devour a creamy, fluffy cake topped with and surrounded by strawberries. The patient people behind the stall were kind and organized enough to let us keep the cake in their fridge until we’d pick it up later in the day. Bibimbab, that national Korean dish of warm white rice topped with namul (seasoned vegetables) and gochujang (chilli pepper paste), stirred together by the diner just before eating – bibimbab made a star appearance as well. Catching an early KTX train had paid off. We arrived at the stall just as they were prepping the humongous bibimbab, glistening strawberries at the ready, and a handful of large wooden spoons. 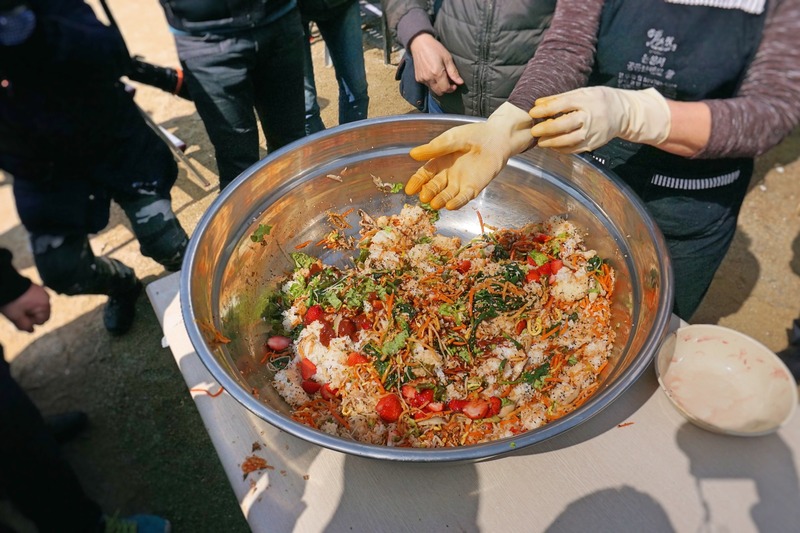 Some lucky onlookers had been asked to stir the bibimbab, and stir they did, enthusiastically. But we were lucky too to skip the queue that had by now invaded the next stall’s space. Photographer-journalists recording the event were asking us to feast on the strawberry bibimbab while posing for the camera. Happily, yet awkwardly we obliged. Perhaps somewhere out there in another post you’ll find our slightly perplexed smiles, trying to look pretty while having rice. The bibimbab was rich in flavour, the strawberries an unusual, tangy addition. We could’ve easily had more, but by the time we’d finished our portion, the empty bibimbab bowl was already being packed away. A flash success event – it was time to move on. 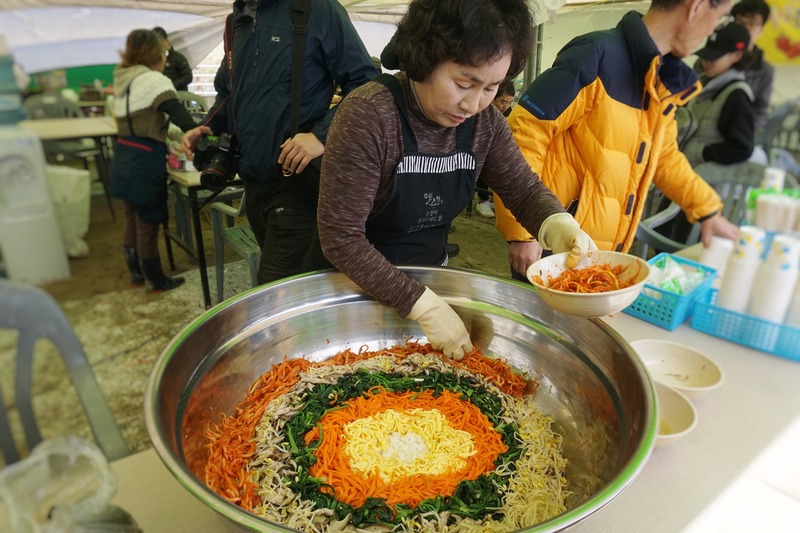 If there’s one thing Korea has enough of, it’s food. And a variety of it at that, with endless new inventions. 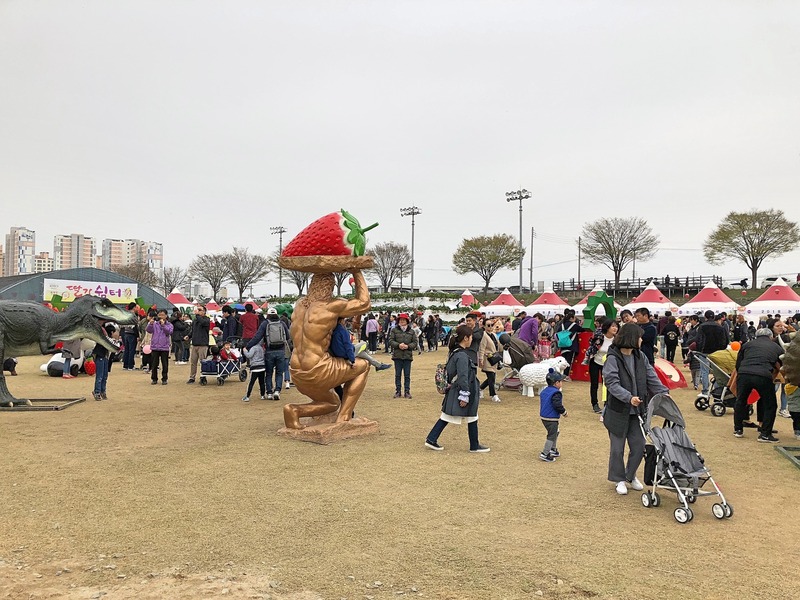 The people behind the Nonsan strawberry festival were no less creative. 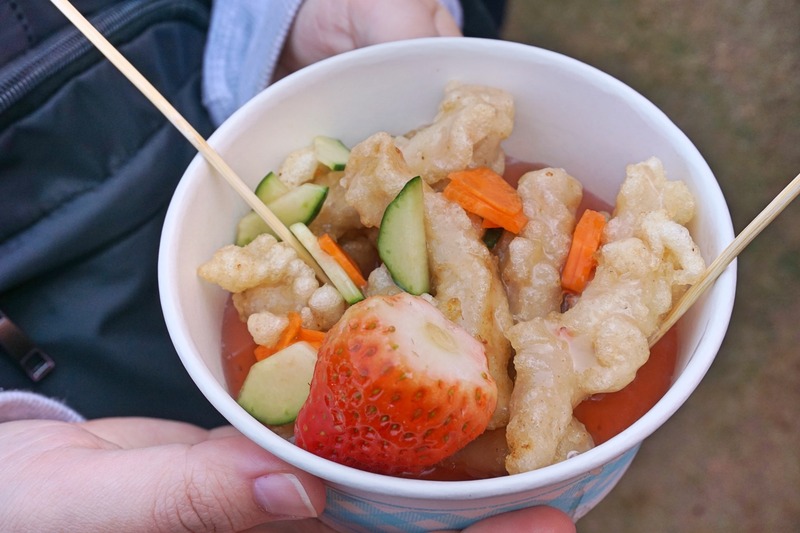 Yes, there was strawberry tea, and bibimbab with the fruit, but also strawberry makgeolli (the Korean milky, lightly sparkling rice wine that I go crazy for), strawberry-flavoured rabbit-shaped candy floss, and strawberry tangsuyuk. Tangsuyuk is a Korean-Chinese dish of sweet and sour beef or pork. 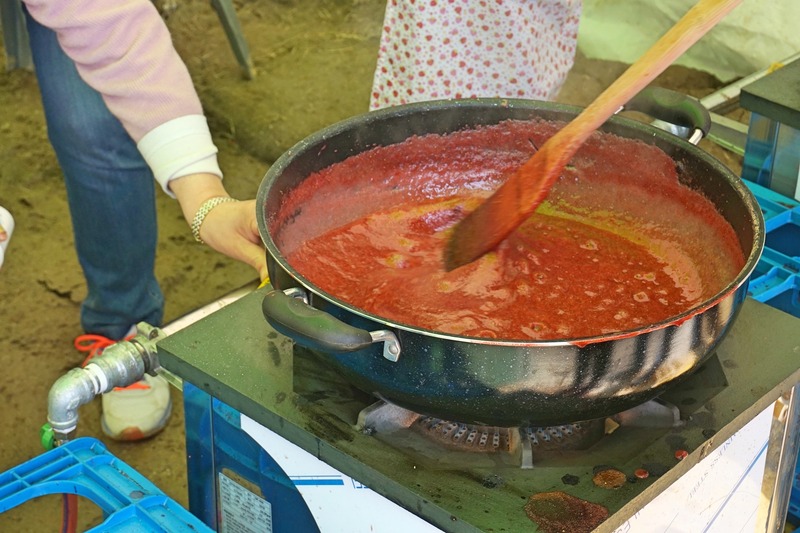 Fruits are not foreign to the dish – the sweet and sour sauce is made using fruit and vegetables such as cucumber, onion, carrot, mushroom, and pineapple. Why not add a few of those red, juicy berries as well? Post-tangsuyuk, it was time for us to make our way to the bus. One of several that would take us festival-goers to one of the many surrounding strawberry farms. But first we could not resist a second cake extravaganza. This time it was a macaron-cream-strawberry concoction, and I, surrounded by more children, carefully assembled the mini gateau as per instructions. There is something strangely liberating and calming about focusing on putting something together while in the presence of little human beings all focusing on the same thing. 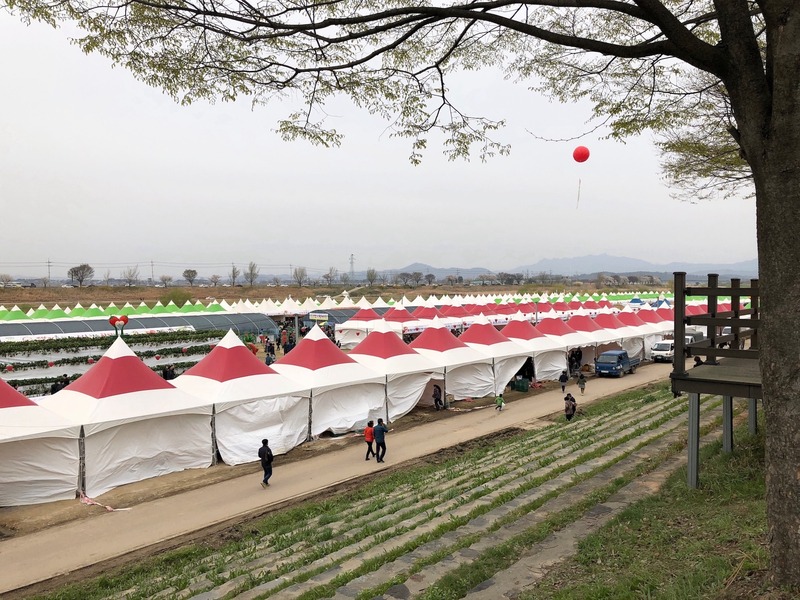 Nonsan is a city that produces crops such as ginseng, napa cabbage, watermelons, and Korean pears. The strawberries that are grown in this agricultural region are of no less than five types: seolhyang, the sweetest, maehyang, geumhyang (all three developed in Nonsan), janghi (akihime, the most commonly grown in Korea), and yukbo (red pearl), the latter two both from Japan. The you-won’t-believe-it-until-you’ve-tried-it-sweet seolhyang strawberry is not just juicy and tender, but a sudden and successful contender as well. 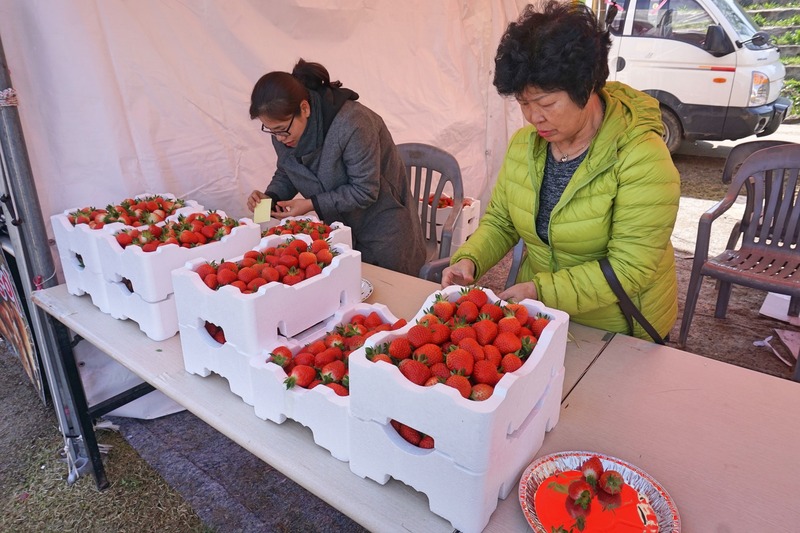 Between 2006 and 2015, the strawberry variety went from taking up 7.9% of the market to 81.3%, while Japanese varieties dropped from 78% to 7.4% during that same time. Armed with a plastic container and permission to eat as many strawberries as we liked, my friend and I set out on a mission to pick the biggest, juiciest strawberries we could find. The greenhouse was filled with five long rows full of the flashy red fruit. We picked and ate and picked with no end in sight. Once our time was up, we left with sticky fingers and the deliciously sweet taste of seolhyang strawberries stuck on our tongues. There’s something about picking them warm off the vine that just can’t be replicated – even a few hours later, having returned to Seoul, they simply didn’t taste the same. 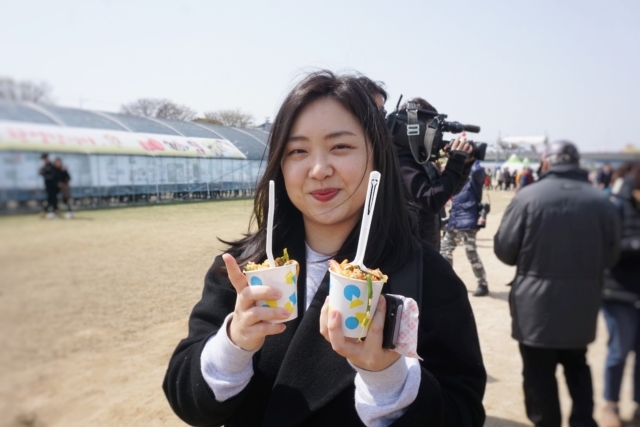 One last surprise greeted us as we left the seolhyang strawberry farm: injeolmi, a variety of Korean rice cake made by steaming and pounding glutinous rice flour, shaped into small pieces, and then covered with steamed powdered dried beans and other ingredients such as – you guessed it! – strawberries. The sticky, sweet dessert was the perfect end to our Nonsan culinary adventure (never mind the prawn and meat pizza we had for dinner at Korean chain Mr. Pizza before heading back on the KTX train). The festival ran from 4th – 8th April 2018 and repeats every year. 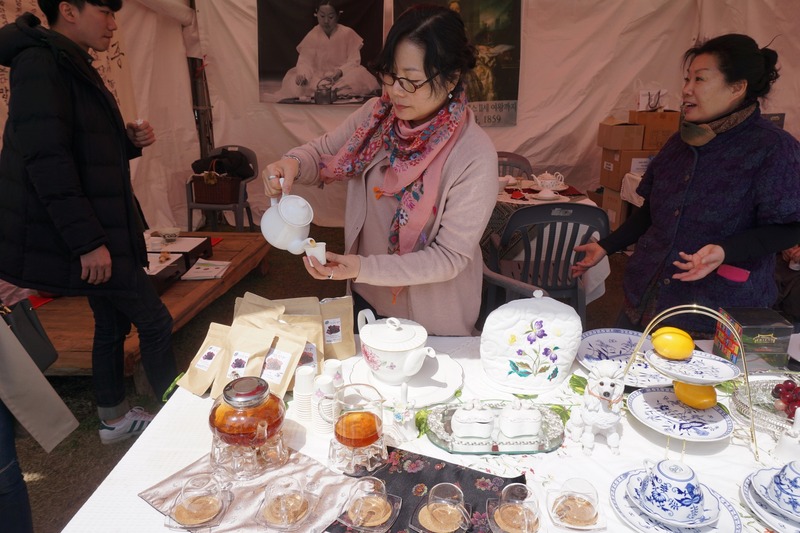 This year it will be held from 20th – 24th March 2019.